The scientific name of the silver-haired bat is derived from Greek and Latin words meaning "night wandering shaggy bat." The silver-haired bat is a small, insectivorous, flying mammal. It bat receives its name from its dark, silver-tipped fur. The fur is usually dark brown to black, with silvery-white tips giving a frosted or silvery appearance, although the tips may also appear yellowish. Their wings are black as are the ears and interfemoral membrane. The interfemoral membrane is a thin layer of skin which stretches between the bats legs. It assists the bat with flight and catching prey. The silver-haired bat has short ears (15 to 17 mm in height), which are rounded and hairless with a blunt tragus. The tragus is a fleshy projection that covers the ear canal, the entrance of the ear. People have a tragus, too, but it doesn’t play a role in echolocating as it does in bats. Because each species of bat has a different shaped tragus, this is a good way to identify them. The silver-haired bat is a medium sized bat ranging from 9–11.5 cm in length and 8–12 grams in weight. Only four known specimens of this species have been collected in Southeast Alaska. Abundance, population trend and distribution is relatively unknown but suspected rare. Loss and fragmentation of forest habitat as a result of deforestation is probably the greatest concern regarding this species. The silver-haired bat breeds in late September and fertilization is delayed until spring, with a gestation period lasting 50-60 days. A litter of 1–2 young is born in June–July, sometimes later in the north. Offspring cling to their mothers and nurse on their milk for around 18 to 21 days until they can fly on their own, usually at about 3 weeks, and are sexually mature by their first summer. Silver-haired bats are generally solitary animals except when found in maternity colonies, and during courtship and mating in autumn when both sexes congregate for migration. Maternity colonies are small, usually consisting of only a few individuals compared to those of little brown bats or Keen’s myotis which can number in the hundreds. A maternity roost, as the name suggests, is similar to a day roost but is made up of a congregation of female bats and their offspring and is formed almost exclusively in tree cavities or small hollows. Though their diets vary widely, silver-haired bats feed chiefly on small, soft-bodied insects. Silver-haired bats have been known to take flies, midges, leafhoppers, moths, mosquitoes, beetles, crane flies, lacewings, caddis flies, ants, crickets, and occasional spiders. Silver-haired bats are opportunistic hunters, foraging on any insect they come across, but can usually be found foraging for small to medium-sized flying insects occurring in large concentrations over small water bodies within forested areas, and over forests, in openings, and along edges. The silver-haired bat is known to both migrate and hibernate. It generally migrates south in autumn to more mild climates where it hibernates, but it has also been found hibernating in the more northern latitudes of its range during winter months. Although normally solitary, silver-haired bats will join in groups for migration. 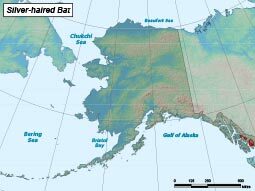 The range of the silver-haired bat it Alaska is relatively unknown, but suspected to be very restricted, and appears to reach its northern limit south of 59° N, in temperate rainforests of Southeast Alaska. This species has been reported to occur as far north as Prince William Sound, but specimen data is lacking to substantiate this claim. L. noctivagans may migrate from interior British Columbia to Southeast Alaska in winter because of milder climate. Only four known specimens have been collected, all from Southeast Alaska during winter. A juvenile was found in a boat shed on the Taku River near Juneau in November 1964. The second was found dead in a woodpile at Wrangell during February 1992. Two other specimens were collected in January 1995: one was found dead clinging to the side of a house in Petersburg; and another was found alive in a house entryway in Ketchikan. 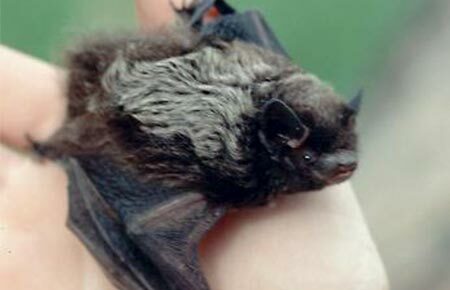 Forested (frequently coniferous) areas adjacent to lakes, ponds, and streams, are preferred roosting sites for the silver-haired bat but they will often occur in areas distant from water as well. During migration sometimes occurs in xeric areas (environments which receive very little annual precipitation). Summer roosts and nursery sites are in tree foliage, cavities, or under loose bark, sometimes in buildings. In Manitoba, migrants roosted typically in narrow crevices in tree trunks. Young are born and reared in tree cavities or similar situations. In South Dakota, maternity aggregations were primarily located in woodpecker-created cavities in ponderosa pines. Hibernacula (hibernation sites) of silver-haired bats typically occur in small tree hollows, beneath sections of tree bark, in buildings, rock crevices, in wood piles, and on cliff faces. Occasionally they will hibernate in the entrances to caves, especially in northern regions of their range.